These materials are made from 100% premium quality nylon that is available in Width: 2-1/2 inch, Length: 25 yards. 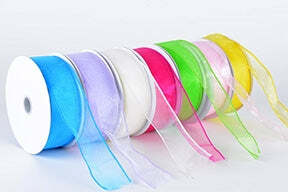 Organza thin wire edge ribbons are used in making stylish and formal bows, and kind of decoration works. They are especially used to make ribbon flowers so as to decorate any gift wrapping that gives an elegant look to your gift. This ribbon gives you cute and pretty accessories that you can use for your special occurrences. Due to its flexibility that these ribbons offer, it is easy and relaxed to craft out shapes from the same. It is used to keep the beauty of the craft project complete and gives it a very subtle and impressive look. These ribbons are very useful for decorative idea like weddings. You can also use these ribbons if you want to make unique and different flower arrangements. That is something different from all other arrangement and decoration. There are various colors, sizes and patterns that are available at bbcrafts.com at very nominal price. So, get up and browse through all the categories of the ribbons and select your choice that meets your requirements.